Will Sony's new eco 'mini notebook' make you green with envy? An eco ethos has certainly latched on to the whole of the technology industry of late, with Sony the latest CE company to announce its green-friendly laptop – the Sony Vaio W Series. Now if the W Series sounds familiar, don't fret as it is. The series was launched to much fanfare by Sony last year and this newly announced update is no different apart from some ecological tweaks. For a start, the laptop no longer comes in a box but a bag. And not just any bag but one which is made from recycled plastic which saves on CO2 emissions in production. So far so green. The Sony Vaio W series' planet-saving attributes don't just end there, though, as the computers chassis is made from 80 per cent recyclable material. Essentially, most of what you see has been either a CD or DVD at some point in its life. As this means that the polycarbonate is a big feature on this Vaio – a material set to rise significantly in price – it will be interesting to see what price-point Sony will come up with for the diminutive device. Something the company is so far hush-hush on. As you can get a regular W-series netbook for around £380, we would expect this to come into the £400 plus bracket. The computer itself houses a 10.1-inch screen but is not a netbook – well, not in Sony's eyes anyway. Coming equipped with an Intel Atom N450 processor (1.66GHz) and 1GB of memory, for its size the computer is a speedy little thing. This probably has something to do with having Windows 7 Starter Edition installed; a programme that takes little power to run. Although we are not over-awed by the specs (most netbooks pack similar credentials) the 250GB hard drive does mean that there's enough room to store ample media. The screen is bright, using LED technology and packing resolution of 1366 x 768 and when it comes to weight, it's a rather lean 1.32kg. The overall look of the machine is definitely desirable. Although the slight green tint may put off some punters it will remind you constantly that you are being GREEN! Typing on the Sony Vaio W series is passable. Although it never feels as plasticky as most netbooks, Sony's key structure on its laptops is a Marmite affair. For some it will feel like you are typing on a desk. Luckily, there's enough space to spread your fingers over the keyboard. Couple this with hand additions like the Motion Eye - a webcam for Skype and the like and the W series has some great attributes. Whether you see the eco credentials as a gimmick or not, the W series is a nice-looking and decent performing addition to Sony's Vaio range. We would still like Sony to rid itself of the 'Mini Notebook' tag and call the thing a netbook, but semantics aside if you are looking for a small-factor laptop, then the Vaio W series delivers. 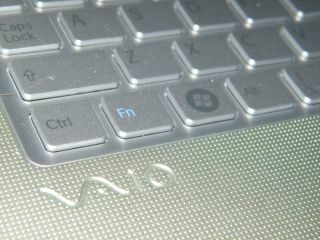 The new VAIO W Series notebook by Sony has a UK release date of February 2010. UK pricing is still to be announced. Go to www.sony.co.uk for more details.